Creamy rice pudding flavoured with oranges, lemon, vanilla and Marsalla wine served with delicately poached Nectarine slices. Remove the seeds from the vanilla pod. Cut the nectarines into 6 or 8 wedges. Discard the stone. Juice the oranges and add the juice to the white wine. Bring this to the boil with the brown sugar. Add the nectarine wedges, the vanilla seeds and pod and the cinnamon stick. Reduce the heat to a simmer and cook the fruit for 5 to 10 minutes depending on the ripeness of the nectarine. Remove from the heat and keep to one side. 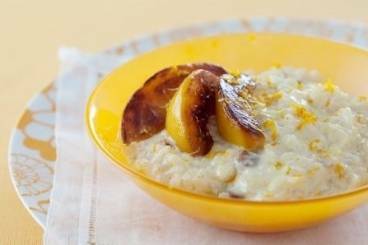 To serve: Spoon the rice pudding into a bowl and serve the nectarines on top with a generous drizzle of the cooking liquor.